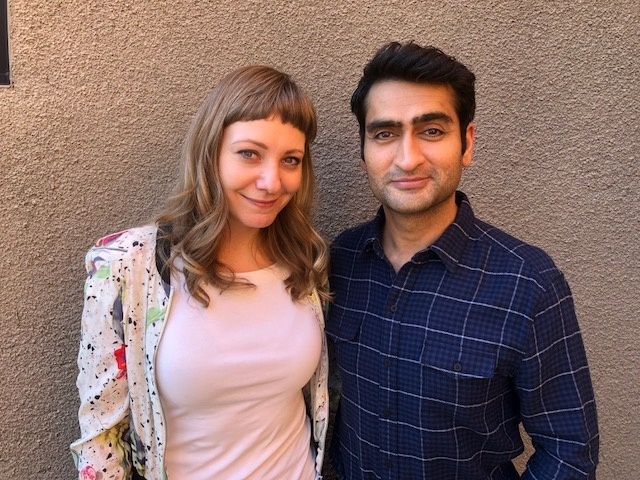 Emily V. Gordon and Kumail Nanjiani, Oscar-nominated screenwriters of "The Big Sick." Kumail Nanjiani and Emily Gordon at the premiere of their film, "The Big Sick," at the 2017 Sundance Film Festival. 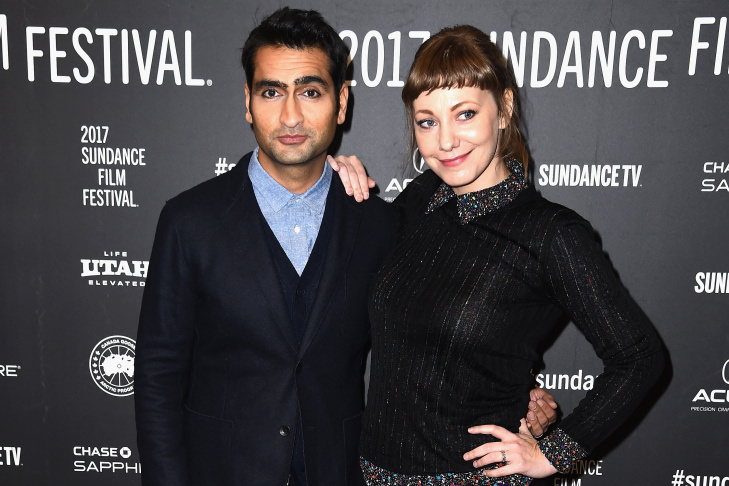 When “The Big Sick” premiered at the Sundance Film Festival in January, 2017, Donald Trump had just been sworn into office, women were marching in the streets, and the husband and wife team who wrote the film were nervous. KN: I was terrified. Emily was a lot more confident than I was. Not that I wasn't confident in what we made, I'm just a worrier. EG: I didn't know what the possibilities could be for this. I wanted the movie to play well at Sundance and I wanted audiences to like it. I wasn't thinking beyond that. A year later, "The Big Sick" has made almost $56 million in the global box office, the couple has traveled around the world promoting the film, and they have an Oscar nomination for Best Original Screenplay. The two recently came by The Frame studios to talk with John Horn about the past year and some things they've learned. We've been very open from the beginning — you know, we're not making "Lincoln." Our lives were a jumping-off point and we wanted to make a good, fictional movie based off an experience we had. But people really assume everything in the movie is exactly how it happened. Whereas in standup, people assume it's all fabricated. Even though when I do standup, it's way more true than this movie. Among the made-up plot points in "The Big Sick" is the part about Emily's father (played by Ray Romano) cheating on her mom. They insist that her father, who is a bee keeper, is quite faithful. 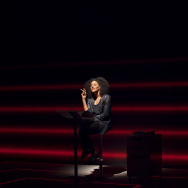 In the film, Nanjiani plays a version of himself. He’s a struggling comedian — which he was when he and Emily first met — and he’s getting pressure from his Pakistani Muslim parents to marry a woman who shares their background. Emily, who is played in the movie by Zoe Kazan, is a white Southerner who does not fit the bill. EG: Interestingly, a lot of [foreign journalists] came into interviews and said, Oh, I assumed that it would be Emily's parents that would have a problem with Kumail. Which I thought was interesting. I didn't hear that in America as much as I did in other countries. And it was just a question, not them saying, I think this is bad. KN: I won't name the countries [but] you realize, traveling around, that there are certain countries where making racially charged jokes about stereotypes is a lot more acceptable than here. EG: While asking you questions. EG: And nobody thought it was weird. KN: We thought it was weird. There's parts of Europe where those types of jokes are a lot more acceptable. It was very strange. Over the year that they’ve been out promoting “The Big Sick,” Gordon and Nanjiani have found that topics in the news dovetailed with issues raised in the movie, specifically about representations of Muslims and women. EG: I don't know what it was like to have a movie out before #MeToo, before all of this. We only know this reality, which is that we are asked very tough questions on carpets about really tough situations. Which is kind of awesome — I'm happy that we are out at this time. But I think more than what we say, for me personally, and also probably for [Kumail], it's that there is a microphone in front of us. Thank goodness. 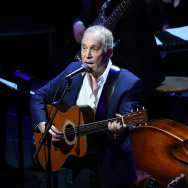 We haven't always had — I haven't had — the opportunity to have a microphone in front of me often. And as a woman, I think that's my job. To speak into the microphone. It may not even matter what I'm saying as much as that I'm talking. And a young woman might see it and [think], Oh, I could probably do that too. Then it's my job to lift up other women. KN: The immigration stuff, the assimilation stuff, the Muslim ban, is obviously stuff that I've been thinking about for a really long time. And people are like, Oh, your movie came out at a time when this is so relevant. It's always been relevant. It's not like Muslims were portrayed as saints 20 years ago. It's always been like this. It was Iran in the '80s. There's been a history of this. It was the Taliban before it was ISIS. And now we're all ISIS. EG: And by the way none of that has anything to do with Islam, but that's where we are. KN: That's the problem. It's that a very small group gets to represent a very big group. And if you don't get different kinds of portrayals, then you're not going to have a nuanced understanding of a group or culture.